The Committee to Protect Journalists and other press freedom organizations are holding a press conference outside the White House to demand justice for murdered Saudi journalist Jamal Khashoggi. The event comes ahead of a Friday deadline for the Trump administration to deliver a report to the Senate on the journalist’s murder. In the report, the administration is required to say whether they believe Saudi Crown Prince Mohammed bin Salman is responsible for Khashoggi’s murder, and to say whether they will impose sanctions, according to CBS. In October, Corker and Menendez triggered the Magnitsky Act, giving Trump 120 days to say whether MbS “is responsible for Mr. Khashoggi’s murder.” The deadline is tomorrow. There are doubts that the W.H. will respond, so advocates are holding a presser to pressure the admin. House Speaker Nancy Pelosi has named members to the new select committee on climate change, but Politico reports they don’t include the highest-profile freshmen like Rep. Alexandria Ocasio-Cortez. Rep. Kathy Castor of Florida will chair the committee, according to the Politico report. The Democratic members are Ben Ray Luján (N.M.), Suzanne Bonamici (Ore.), Julia Brownley (Calif.), Sean Casten (Ill.), Jared Huffman (Calif.), Mike Levin (Calif.), Donald McEachin (Va.) and Joe Neguse (Colo.). Sen. Kamala Harris and Rep. Brenda Lawrence have introduced a bill to award Aretha Franklin the Congressional Medal of Honor. Donald Trump weighed in on abortion in his remarks at the National Prayer Breakfast, per PBS. The comments come after he proposed a federal ban on late term abortion in his State of the Union speech. He’s trying to reverse laws like on recently passed in New York, which allows abortions after 24 weeks to protect the health of the mother or if the fetus is not viable. 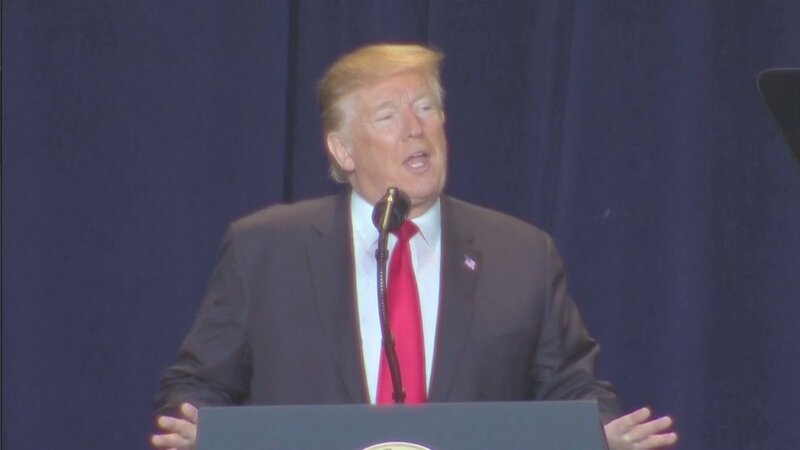 Trump also made a verbal slip, saying that many of America’s great accomplishments including the “abolition of civil rights” were driven by people of faith. A scandal centered on the use of blackface is rocking Virginia politics, but a new poll finds that not everyone has a problem with white people wearing blackface. In the YouGov poll, a clear majority – 58% – did say it was unacceptable for a white person to wear blackface makeup. But that leaves 16% who said it was acceptable, and 26% who aren’t sure. 73% of black respondents said it was unacceptable, compared to 57% of whites. There was a clear party divide as well, with 81% of Democrats calling blackface unacceptable, while only 44% of Republicans did. Asked if Virginia Gov. Ralph Northam should resign after a photo from his yearbook page surfaced showing a man wearing KKK robes and another in blackface, 40% said he should, 30% said he should not, and another 30% weren’t sure. Donald Trump claimed in his tweet storm earlier today that the Republican-controlled Congress never investigated President Barack Obama. This is not true. Congress conducted a lengthy probe of the Benghazi attacks, in addition to investigations into allegations of political bias at the IRS and other matters. Read the Washington Post’s fact check here. Donald Trump spoke this morning at the National Prayer Breakfast. “I will never let you down,” he told the religious crowd, according to CBS News. House Democrats will hold their first hearing Thursday morning on a bill that would require presidents to disclose their tax returns, CNN reports. Donald Trump has been the first president in modern history to refuse to release his taxes. The hearing before a House ways and means subcommittee panel will focus on a provision in a broader ethics bill that would require future presidents and presidential candidates to release ten years of tax returns. The bill doesn’t apply to the current occupant of the White House, but Congress also has the power to obtain Trump’s taxes from the IRS. The father of a murdered Parkland student, who clashed with Florida representative Matt Gaetz at a congressional hearing, said Thursday the congressman’s rhetoric was “offensive”. Manuel Oliver shouted out in protest after Gaetz, a Republican, brought up illegal immigration at a hearing on gun violence and said that building a border wall would help prevent murders committed by unauthorized immigrants. Gatez asked for him and another Parkland dad to be removed from the hearing room, but they ended up getting a warning, according to NPR. “Don’t bring the wall as a solution for everything,” says the father of a murdered Parkland student who clashed with a GOP Congressman yesterday. @RepMattGaetz alleged illegal immigration was a greater threat than guns. House speaker Nancy Pelosi vowed that there will not be another government shutdown over Donald Trump’s demands for a border wall. Pelosi predicted that after a widely unpopular partial government shutdown that lasted 35 days, Republican leaders would not be willing to go along with a shutdown again. “I have a club that I started, it’s called the ‘Too-Hot-to-Handle Club’. And this is a too-hot-to-handle issue,” she said. A stopgap funding bill that was passed to end the shutdown is set to expire on 15 February. In the interview with Politico, Pelosi also took a shot at Trump’s State of the Union speech. As political scandals roil Virginia, Donald Trump charged Thursday that Democrats “are killing the Great State of Virginia”. The state’s politics have been in turmoil since a racist photo surfaced on Governor Ralph Northam’s medical school yearbook page. Within days the lieutenant governor was publicly accused of sexual assault, and the attorney general admitted he had also worn blackface while in college. Donald Trump is attacking the congressional investigations planned by the new Democratic House majority, calling them “unlimited presidential harassment”. Trump in a series of tweets Thursday morning called the expected congressional investigations a continuation of the “witch-hunt” he has accused special counsel Robert Mueller of pursuing with the ongoing investigations into Russian election interference, which has resulted in a host of indictments of Trump’s associates. “So now Congressman Adam Schiff announces, after having found zero Russian Collusion, that he is going to be looking at every aspect of my life, both financial and personal, even though there is no reason to be doing so,” he said, referring to the new chair of the House intelligence committee. Representative Alexandria Ocasio-Cortez will on Thursday release her Green New Deal resolution, beginning to put policy specifics behind what became a campaign rallying cry. The six-page proposal calls for a carbon neutral economy within 10 years, and says the federal government should “achieve net-zero greenhouse gas emissions” by getting all power from “clean, renewable and zero-emission energy sources”. Sixty members of the House and nine senators are co-sponsoring the resolution. It doesn’t stay strictly focused on climate policy, but endorses a host of progressive priorities including universal healthcare, a jobs guarantee and free higher education.